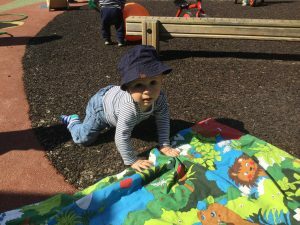 I hope that you had a lovely Easter break with your families and it has been a delight to see the children making the most of the recent sunny weather. 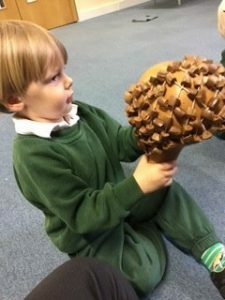 The children have been very excited by the arrival of new playground equipment and outdoor toys. This week in Foals 1, we have been enjoying the beautiful weather. 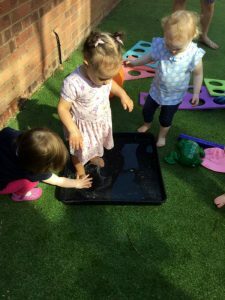 We went outside with a blanket into the playground to make the most of the sunshine, and we also had a water tray inside so we could play in the water in the coolness of our room. 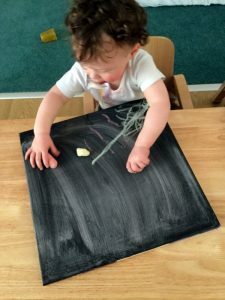 This week, Foals 2 have enjoyed many activities including painting on bubble wrap to create our butterfly for our ‘Very Hungry Caterpillar’. 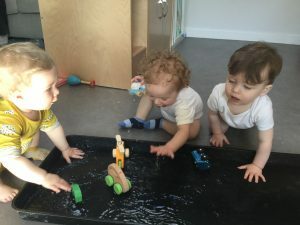 We kept cool in the hot weather by playing with ice, shaving foam and splashing in water. 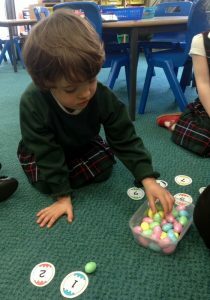 During the Easter break we enjoyed making the most of the school’s resources available to us. 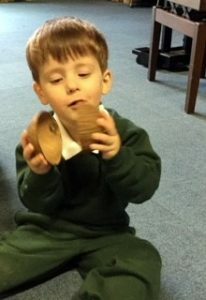 We visited the Performing Arts Centre to experiment with lots of different musical instruments. 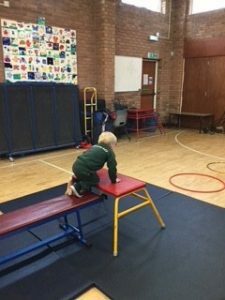 We also went into the Dining Hall to use the PE equipment. 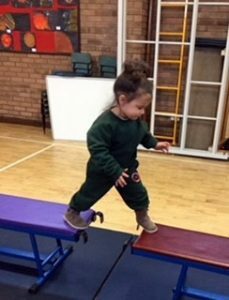 The children thoroughly enjoyed balancing on the equipment and jumping through hoops. We have also spent lots of time in the garden since the weather has been so nice! The children in Ponies were thrilled when they were joined by two real firefighters during ‘Circle Time’. 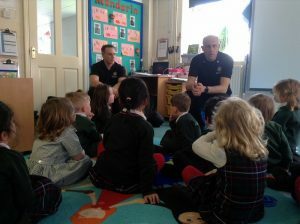 The firefighters told the children all about the fire engines and the equipment they used. The children are looking forward to the arrival of a batch of eggs and an incubator to hatch out their own chicks. They are busy practising their counting skills in readiness for counting the newly hatched chicks! 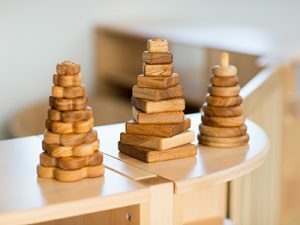 A reminder from Louisa French Photography that Sunday is the last day for ordering your child’s Nursery photographs. We are holding our School Open Morning on Thursday, from 9.30am to 12 noon. 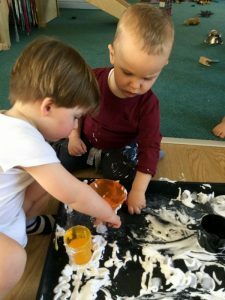 This is an informal, drop-in morning so please do come along and see what exciting adventures await your child after the Nursery! It is not yet too late to buy tickets for this very popular event on Friday 11th May! Please click here for information on how to purchase your tickets. If your child is in Yearlings or Ponies then please ensure that they come to Nursery wearing the correct uniform, including the outdoor coats. Please find an up-to-date, revised and simplified Uniform List here. Thank you. A reminder to please keep a very close eye and hand on your children at all times in the car park. There was a ‘near miss’ in the car park last week so please do be vigilant and remind grandparents and other people who may be collecting your child. After the recent glorious weather, it is pertinent to remind parents that, following the return of the permission slip, we will apply SPF 50 hypoallergenic children’s sun cream as necessary to your child. If your child requires their own particular brand of sun cream due to allergies then please bring it in, clearly labelled with your child’s name. Please also ensure that your child has a sun hat in school at all times during the warm weather. Please can we remind parents not to put Calpol or any other medication in your child’s bags. The children have access to their bags throughout the day. If required, we are happy to give your child Calpol following a telephone call to you. If your child needs any other medication such as Piriton or an inhaler, please fill out an authorisation form for us to give this medicine and we will keep the medication securely in a locked cupboard. Thank you for your co-operation in keeping the children safe.